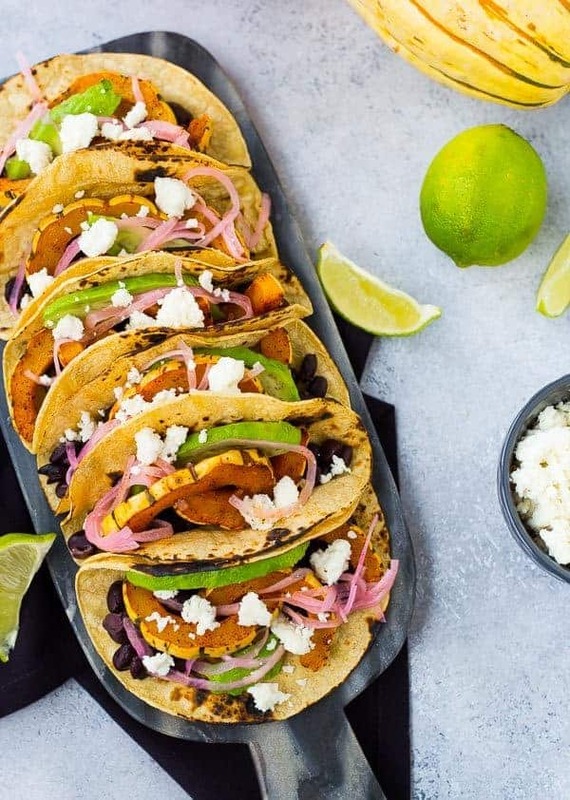 You’ll never miss the meat in these flavorful fall vegetarian tacos made with delicata squash and black beans. Topped with pickled red onions, avocado, and queso fresco, you’ll be coming back for more and more! Last Friday we hosted a Harvest Party. Michigan wasn’t cooperating and gave us a cold, rainy day. Unfortunately that eliminated our plans of putting up a bounce house for the kids and sitting around the bonfire drinking hot cider. Instead, we had 20 adults and 20 kids inside our house! Sounds amazing, right? Our house is plenty big for us, but it’s not a mansion and that number of guests was definitely pushing the upper limits of capacity. It was pure chaos, but everyone had a great time and all 20 of the kids got along really well, thankfully! When we moved into this house, the basement was finished but they let their cats urinate everywhere down there. The smell was AWFUL but we took our chances and put an offer in anyways. We pulled out the carpet as soon as we moved in, along with the carpet pad, AND two feet of drywall. We sealed the floor with a primer type sealant. Then, we waited a year to go through all the seasons and make absolutely sure the smell was gone. Now, we finally have a designer and a contracter lined up. The basement is about 1/3 of our house so I’m thrilled that we’re going to have it available for use in a few months. Anyways, long story short, I’m happy that we’ll have a little more space for next year’s Harvest Party. PS: I bought $75 worth of beef to make this chili – it was such a hit last year that I wasn’t allowed to not make it this year. Highly recommend! If you’re not making it for a crowd, it won’t be quite as pricey. The beef melts in your mouth and the flavors are amazingly complex thanks to the usual chili suspects plus cinnamon, chocolate, and dark beer. Now let’s talk about these vegetarian tacos!!!! I’m really excited about these, you guys. 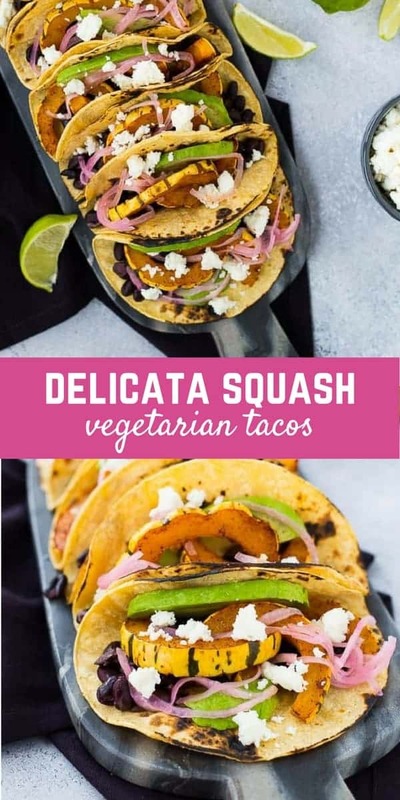 On Monday, I went on and on about how much I love delicata squash and how to cook delicata squash, And as promised, this is a fun way to use it. I made it exactly the same way as I described on Monday except I sprinkled it with a little chili powder to give it a southwestern spin for these tacos. 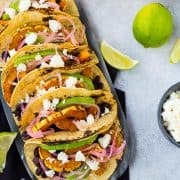 I warmed up some corn tortillas — I love their texture and flavor, but these vegetarian tacos would also be fantastic with flour tortillas if that’s more your style. The fillings would also be great in lettuce wraps. 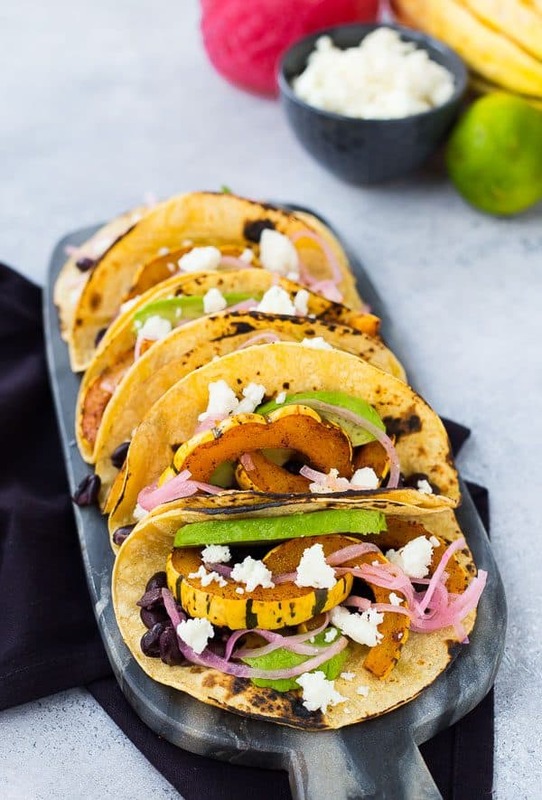 I filled the tortillas with the crispy roasted squash, creamy black beans, and then the toppings! 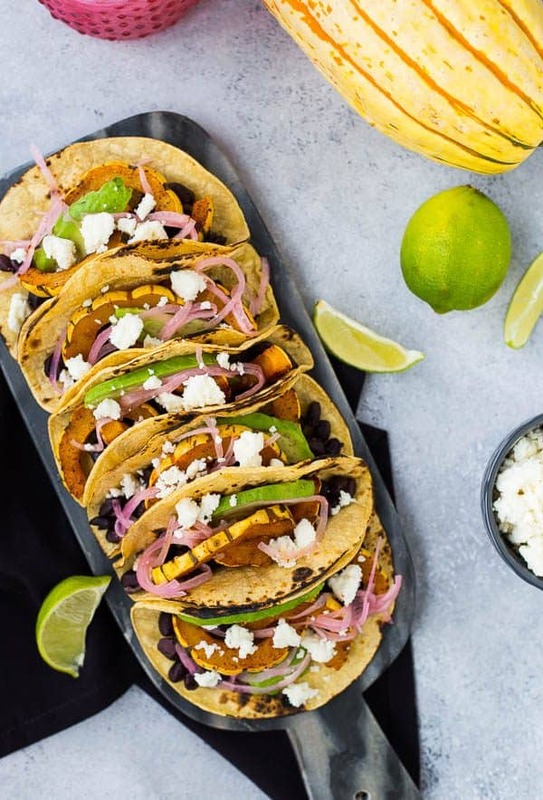 In this case, I’d argue that the toppings aren’t optional in the case of these vegetarian tacos, you’re going to want them all! Queso fresco, creamy avocado, tangy pickled red onions (check out this post to see how to pickle red onions in five minutes! ), and a good hearty squeeze of lime! 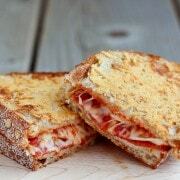 I really hope you try these because I know you’re going to love them as much as I do! Tip: Pickle the red onions a day in advance so they’re ready to go in your fridge! Preheat oven to 425ºF. 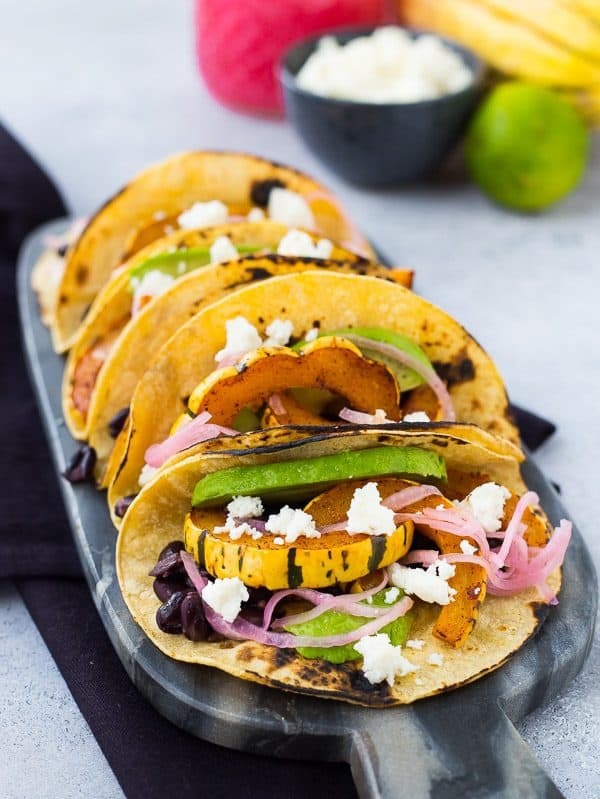 Toss delicata squash slices with olive oil, salt, and chili powder. Spread in a single layer on a sheet pan (line with parchment paper for easy clean up). Roast for 20 minutes, flip each slice, and continue to roast for another 15 minutes or until golden brown on the outside and tender on the inside. 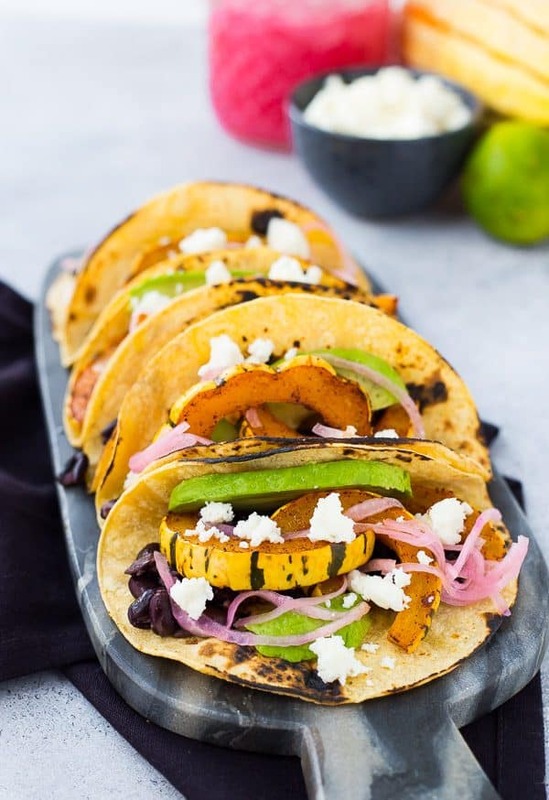 Assemble tacos: Place black beans in warmed tortillas, add squash, red onions, queso fresco, and avocado. 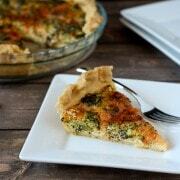 Finish with a generous squeeze of fresh lime juice before enjoying immediately. Verdict: I can’t get enough of these. Husband’s take: The whole vegetarian thing and putting squash on a taco isn’t really Ben’s thing.